Book your Hawaii reservations with an experienced Hawaii travel agent. Complete the request a quote form to the right and we can get started working up a quote. To assist you with your research we can recommend these family friendly resorts and vacation rentals condos. Safe ocean swimming conditions and/or pools that are great for kids. Many resorts specialize in activities and programs for children. Hawaiian hula, crafts and music are included to educate the children about the history and culture of Hawaii. Large families can be booked with adjoining hotel rooms or vacation rental condos. Many resorts include or have access to children’s programs with Hawaiian history and craft programs. The Hilton Hawaiian Village is an oasis in Waikiki with 23 acres on the beach. There are winding paths surrounded by ponds with the biggest gold fish you have ever seen. Parrots, ducks, geese, even some penguins are enjoying their stay at the Hilton Hawaiian Village. here is a spa, just in case you want to enjoy a massage and sauna. Hyatt Regency Waikiki Beach Resort and Spa. The Hyatt properties, on all islands, offer families with children under 12 years a guarantee for connecting rooms at no additional fee. The resort is across the street from the best swimming and surfing conditions on Waikiki Beach. There are lots of fun dining options, a park with acres of open space, children’s zoo and aquarium within walking distance. Rooms with free buffet breakfast for 2 are frequently an option at a discounted rate. Swimming, tubing, and snorkeling in a private lagoon. that runs through the center of the hotel. Disney characters provide entertainment at the Kid’s Club. Hawaiian culture , music and crafts. Hotel rooms and 2 room suites. The Aulani books up early so when there is availability for your travel dates grab it. The Honua Kai, built in 2009, is one of the most luxurious condo resorts in the Hawaiian Islands. Full kitchens and laundry in every unit. Choose from Studio, 1, 2 or 3 bedroom suites, each with a lanai (balcony). The pools are perfect for children of all ages. Family BBQ by the pools The beach is excellent with moderate surf. Restaurants include the famous Duke’s Beach House and a gourmet market on onsite. The Hyatt resorts offer rooms with one queen and one double or 1 king and a full size sofa bed making it a great choice for families with children. There are several swimming pools including one of the only swim up bars on Maui. 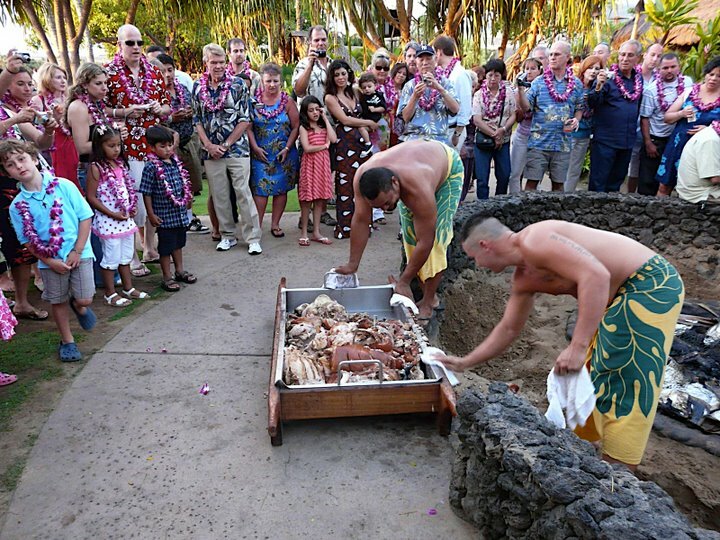 Throught the year the Hyatt Maui offers promotions with 5th night free and full buffet breakfast. Guests who stay for a minimum of 7 nights at two or more Hyatt’s will receive breakfast for 2 people per room, per day. There are several resorts on Maui that offer Kids Clubs. 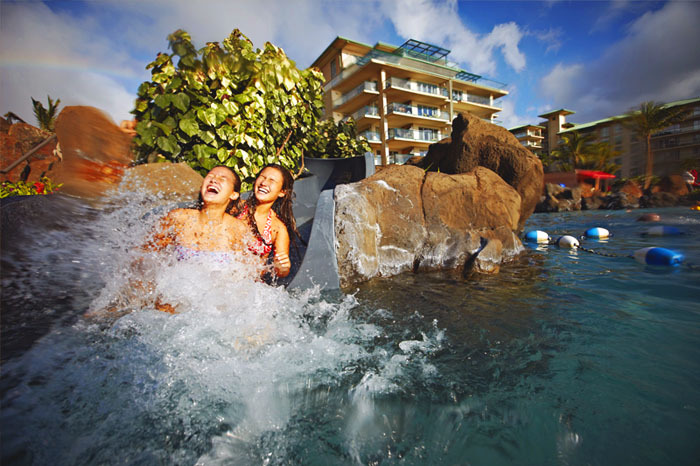 The Westin Ocean Villas children’s program is also available to families staying at the Honua Kai Resort next door. The Family Fun Club is open daily with full-day, half-day and hourly programs. Spa Helani options including massages, body treatments, facials, manicures and pedicures. Honokawai Beach is north of Kaanapali Beach on the west shore. The resort offers 1 and 2 bedroom vacation rentals with full kitchens. Rates are very reasonable at all of the Aston condo resorts. The kid’s club is a reliable opportunity for the folks to take a snorkel or relax for the day. Camp Kaanapali is open to guests staying at any Aston property on Maui. The Grand Hyatt Resort and Spa is a 5 star resort with a great kids club with late evening hours. The experience for visitors is luxury all the way. There is nothing like the Kauai Grand Hyatt at Poipu Beach. The Children’s program utilizes the grounds of the resort. Entertain and educate the children at a level that is appropriate for their age while the adults enjoy the beach, play golf, visit the spa or go sightseeing. Oceanfront condo resort upscale condominium suites that are ideal for families, golf-lovers and groups. On the Coconut Coast (East Shore) of the island of Kauai with nearby restaurants at the Coconut Marketplace. The Aveda Spa Salon; a soft-water river pool with water slides and three sand-bottom whirlpool spas. Full kitchens equipped with Sub-Zero refrigerators and sleek granite counter tops. Hilton Waikoloa Resort is one of the very best destination resorts in the state of Hawaii. The Hilton is built like a village with canals and canal boats that transport you around the resort. A modern rail shuttle runs back and forth from the outer towers to the center of the resort. 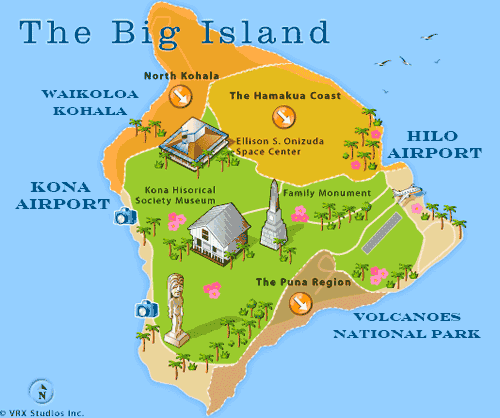 The Big Island is a rugged with many ocean beaches that are impossible for children. The property includes a lagoon that is safe for swimming and water slides for the children. Dolphin Quest encounters and a children’s program for ages 5 to 12. The fitness center, spa and golf course are available for the adults. The island has the only active volcano erupting in an area that is accessible to visitors. Guided Tours to the park can be added to your vacation package. Pick up from the lobby.